Alpine Veterinary Hospital Welcomes You! Welcome to Alpine Veterinary Hospital. We are a full-service animal hospital providing comprehensive and compassionate healthcare to pets in Bingen, White Salmon, Hood River and the greater Columbia Gorge. At Alpine Veterinary Hospital, we are committed to delivering complete care at every stage of your pet's life, including routine preventive services, early detection and treatment of a wide range of conditions and diseases, as well as the best in modern surgical and dental care. Our doctors and staff continuously strive to provide the highest standard of care for your pet. For years, our mission has been to prevent and alleviate fear, anxiety and stress for our dog and cat patients in order to make their doctor visits as fun as possible. We know that when your pets are more relaxed, you are more at ease as well. This makes for a more positive experience for everyone. We are proud to announce that Dr. Maggie Anthony is our first "Fear Free" certified doctor here at Alpine Veterinary Hospital. She has received advanced training in working with exceptionally fearful pets. If your pet is fearful of visiting the vet, please call ahead and ask us about pre-visit pharmaceuticals, which are medications that can be given ahead of the exam. We want your pets to have as positive of an experience as possible when they come to see us! Call us today at (509) 493-3908. We look forward to meeting you and your pets! Through the American Veterinary Medical Foundation’s Veterinary Care Charitable Fund, our hospital is able to help animals rescued from abuse and neglect and the pets of clients facing personal hardships. 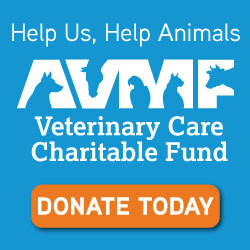 Your donations to the AVMF on behalf of our hospital will help.